From day one of preseason practice the team had the expectation to return to the state meet and compete for a state title. Coach Cavanaugh returned a seasoned team for the 1973 season. Seniors Larry McEwan, Tom Sanidas, John Brown and Kevin Finnegan and juniors Bill Wishnevski and Bill Perkins returned having competed at state the previous November. This talented group was joined by senior Shawn Mulvihill, junior John Longfellow and sophomore Basil Robertson. Shawn would be competing in his first XC season having previously played football. But, Mulvihill ran the half mile in track and decided to give the distances a try in the fall. The team pushed themselves during preseason with morning runs on the beach and afternoon practices on the road or Woodland Park. The team would finish with a stellar 14-1 dual meet record. The only loss was to Terre Haute North (who was nationally ranked). In the dual meet TH North placed four runners before PHS 1st runner, Tom Sanidas, but PHS would get revenge at the state meet. TH North had captured the team title in 1972 and was looking to repeat. The team ran in a number of highly competitive meets and brought home 1st place hardware from several. New Prairie was an early challenge and the Indians brought home the 1st place trophy after first year runner Mulvihill placed 13th as the teams 6th man. His 13th place was better than Hammond’s 6th man, breaking the tie. 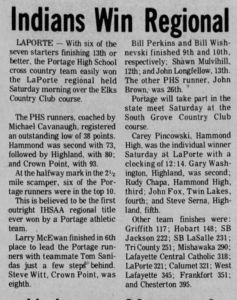 It would not be the first time Portage would compete against the highly talented Hammond team. The team would also compete in a Tri-State meet in Ohio with the top teams from Indiana, Ohio and Michigan. The team would finish second against that tough competition. 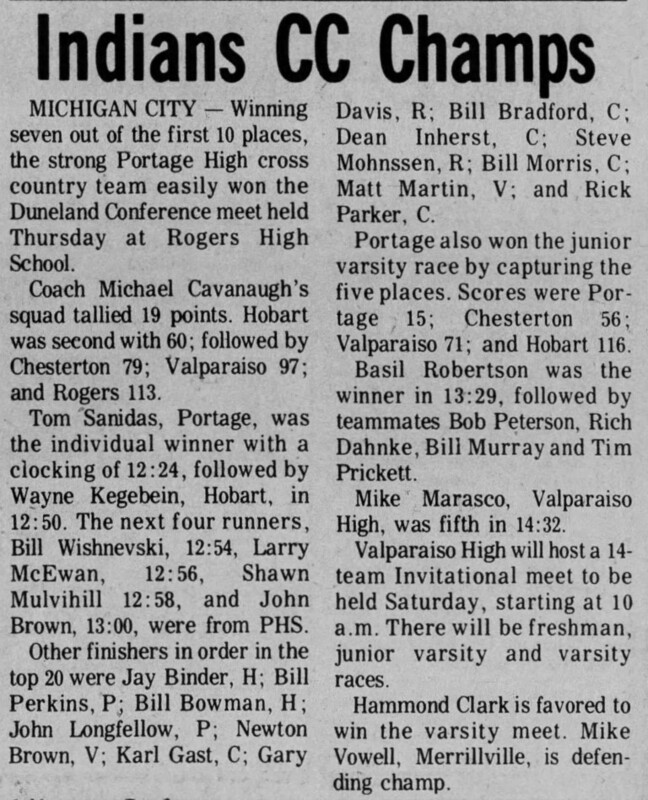 The Indians would easily capture The Duneland Conference with individual champ Tom Sanidas and the other four runners finishing three through six. The other two runners finished in the top ten as well. Expectations were high for the team as it prepared for sectionals. The team easily won the sectionals and regionals to qualify for the state meet. The regional win, reversed a second place to Hammond at the Hobart Invitational. The team was primed and ready for the state meet the following weekend. At the state meet, on November 3, 1973, the Indians competed against three outstanding teams. Terre Haute who had easily defeated them in a dual earlier in the year, Elkhart Central and Hammond. 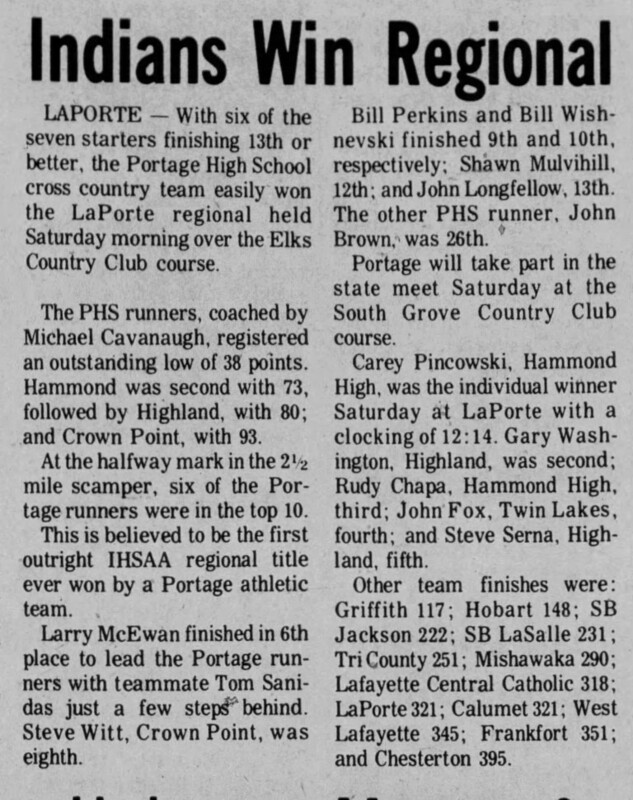 Portage would run an outstanding team race. Tom Sanidas would be the 1st runner to cross the finish line with a time of 12:26 for 9th place in team scoring (12th overall). 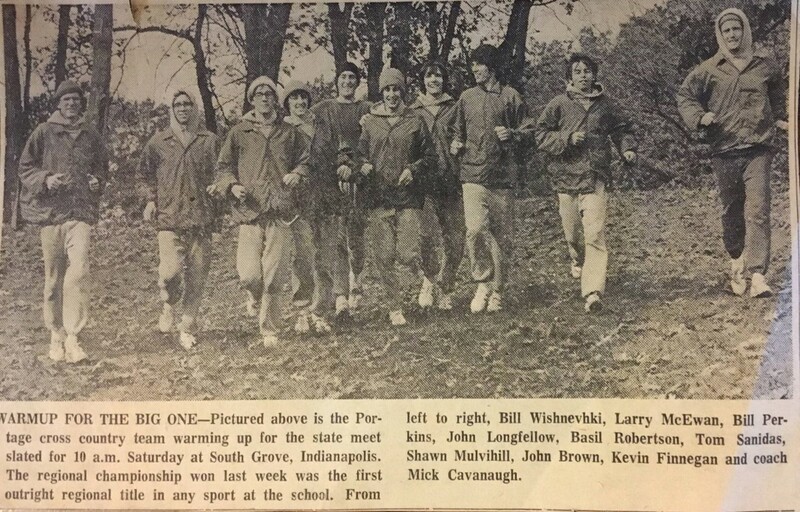 The next six PHS runners would finish within 22 seconds of Sanidas (Mulvihill 12:30, McEwan 12:35, Bill Wishnevski 12:37, Bill Perkins 12:39, John Longfellow 12:45, John Brown 12:48). The top five runners finished within 13 seconds of each other. Each of the top five would finish in the top 27 runners (23 in team scoring). A fantastic feat. The team would finish 2nd behind Elkhart Central (58 points to PHS 76) but well ahead of top ranked Terre Haute North (113) and talented Hammond (115 points). 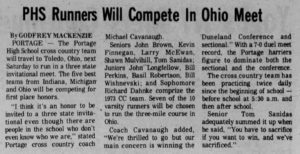 Larry McEwan slipped in the last quarter mile and was stepped on by another runner, slowing him to 3rd place on the team. He has stated that without that occurring, the Indians collect the 1st place trophy. 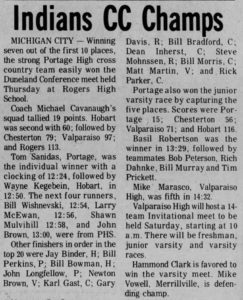 The website INCC Stats.com has ranked teams at the state XC meet since 1973, 44 years of teams. 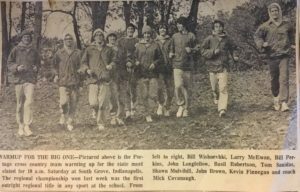 The Terre Haute North team from 1973 is ranked 5th, Elkhart 8th and the PHS team 11th (the Hammond team is ranked 26th). 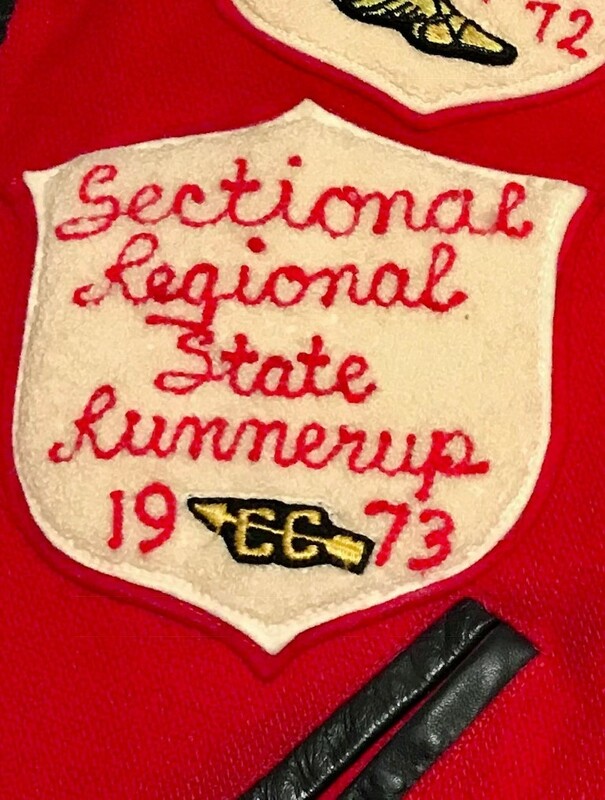 The site has ranked over 1,100 teams and it is clear with 4 teams in the top 26 (over 44 years), that the 1973 is with little argument, the most competitive state meet since 1973. 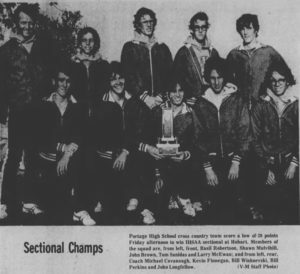 (Note: the 1974 PHS state champions are ranked 12th all-time). 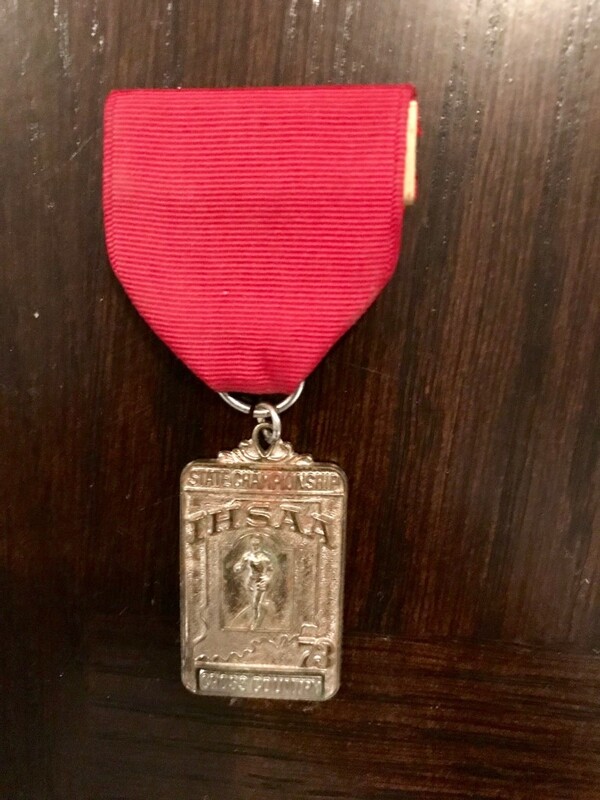 1973 was the first year that the IHSAA would award a Mental Attitude Award. Larry McEwan was the initial recipient of this award. In addition to his talents he was a member of the PHS National Society, as were Sanidas and Mulvihill. Runners and scholars. In Cavanaugh’s final season of coaching XC, the team made it back to the truck and walked away with a 2nd place trophy. At the fall sports banquet, Coach Cavanaugh heaped praise on the 1973 XC season. The coach did not name an MVP as it was clearly a team effort, which indviduals stepping up at various times during the season.